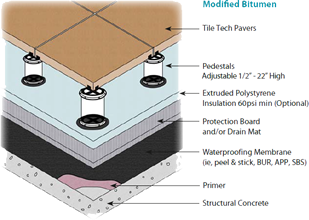 Roof Deck Modified Bitumen - Tile Tech Inc. The application of an elevated paver system provides the designer with new possibilities and advantages. 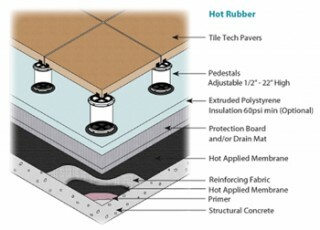 Tile Tech Paver Pedestal system elevates, levels and uniformly spaces pavers thus allowing water to be channeled away from the surface. Roof and Plaza Pavers allow easy access to the roof and waterproofing system for making repairs or standard maintenance procedures. 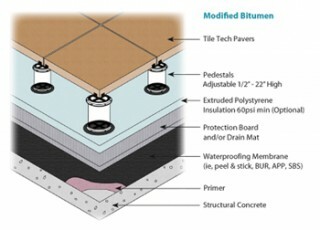 The Tile Tech Pedestal System is designed for concrete pavers to lay level over a built up roof. 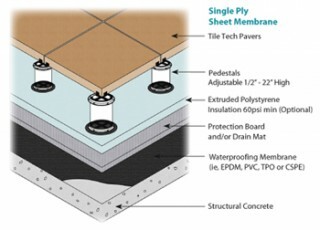 The substrate can be either concrete or wood structure, with a roof membrane over the top. 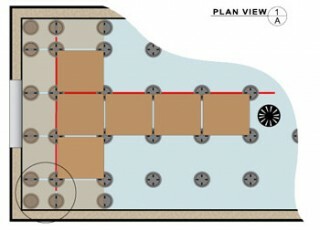 The pedestal system consists of 7 standard pieces and user supplied recommended Schedule 3034- 4.215” diameter PVC pipe.